The Mystical Side: What They Didn’t Teach You About the DSM and Transpersonal Psychology in School, Tuesday, 5-7-19 (Live Webinar) « CE You! Gain a deeper understanding of the groundbreaking recognition of mystical experiences and Near Death Experiences (NDEs) documented in the DSM with Rev. 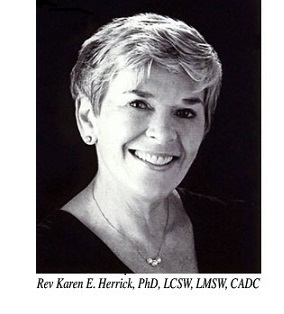 Dr. Karen Herrick, PhD., LCSW, LMSW, CADC . Participants will explore the fascinating definitions of spiritual and religious terms for a more complete clinical assessment, client reactions to Mental Health problems that may be spiritual in origin, as well as recognition of spiritual distress in nursing professionals, and its related considerations for more effective treatment strategies. Rev. Karen E. Herrick, PhD, LCSW, LMSW, CADC, ACMHP has shared her clinical expertise for thirty years in her private practice by lecturing throughout the United States on dysfunctional and addictive homes, disassociation, grief, and loss from a Jungian psychological perspective.